Most people would think that winning the Hopeful Stakes with a horse that your friend told you to buy at auction because it wore a hip number that matched your football uniform number was dumb luck. But Jack Wolf’s good fortune with the horse Shanghai Bobby doesn’t compare in the least with the human Shanghai Bobby’s. Robert Burton won a flip coin that determined he’d play football at Murray State University instead of Marshall University a year before the entire Marshall team was killed in a plane crash. But for heads on a quarter he’d be dead. Not since Smarty Jones has there been a 2-year-old speedball with a name as catchy as Shanghai Bobby. After a disappointingly short post parade that inched horses past the finish line before they skedaddled back in the direction from which they’d come, the 2-year-old son of Harlan’s Holiday, another of Wolf’s former horses, won the 108th running of the $300,000 Hopeful Stakes (gr. II). The colt sped to victory in 1:22.72, the second fastest time since the race was switched to seven furlongs. A crowd larger than could fit in track photographer Adam Coliagnese’s wide angle lens celebrated with Wolf and his Starlight Racing partners in the winner’s circle−but not Burton, a pilot for Delta Airlines who a year ago chose to accompany Wolf, a college football teammate, to the sale at which Shanghai Bobby was bought when a flight to Shanghai that he was supposed to fly cancelled. Burton was in Saratoga last week but not this week. One of Starlight’s principles, Donnie Lucarelli, hails from Schenectady, N.Y. and the entire population of Schenectady was here. Laurie Wolf and the women of Starlight Stable lead Shanghai Bobby into the Hopeful winner's circle. The Honorable Jack Diamond, mayor of the city of Glens Falls, N.Y., graced the winner’s circle one race earlier. Diamond presented the trophy to Stuart S. Janney, III and the connections of Hit It Rich for winning the $150,000 Glens Falls Stakes (gr. IIIT). 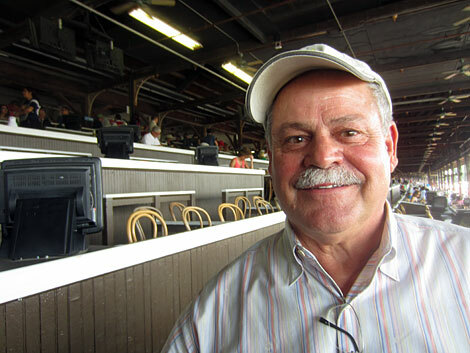 Trainer Dominick Schettino saw Ramon Dominguez produce Alwaysin a Tiz as the winner of the meet’s final 2-year-old maiden race. Rosie Napravnik, who won the Hopeful with Shanghai Bobby, rode the winner ofthe season’s finale, as she did its opening act. Philip Devlin, a retired teacher and coach from Berlin, Conn., won the Pick Six for $26,907. This may not seem so amazing because somebody usually does. But, on Aug. 30, Devlin won the largest consolation Pick Six ever at Del Mar−$145,187.40. On closing day at Saratoga, he singled Always in a Tiz in the sixth and Hit It Rich in the eighth. He doesn’t win by covering every horse. Repole Stables won the owners’ title, Pletcher the trainers’ title and Dominguez the riding title.John Imbriale called the races. The public address system, which caused fits for the meet’s first three programs, broke down again−during the call of the Hopeful. The foodstands ran out of Travers glasses, bags of peanuts, crackers for the clam chowder and Lord knows what else. Otherwise, as far as the numbers went, business was up in all areas. Before the day’s activities began, Wolf and his wife Laurie appeared on morning television. In the few seconds that talk show host Jeanne Wood allowed her guests to sneak a word in, Wolf said that Algorithms, Starlight’s hope in the 2012 Kentucky Derby before the colt incurred an injury, might run in the “See-gar.” On to Belmont. 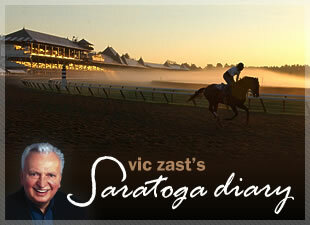 Vic Zast is the author of The History and Art of 25 Travers. He looks forward to being at the races in Saratoga next summer – the 48th in a row for him.